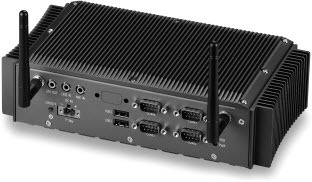 The VIA ART-5450 is a complete embedded box system based on the VIA EITX-3000 board coupled with the new EMIO-3450, offering customers the ideal solution for today's intelligent fleet management and vehicle logistics applications. Boasting a wealth of communications options that include GPS, W-Fi, Bluetooth, GPRS and 3G/3.5G support, the VIA ART-5450 features a rugged aluminum chassis design that can withstand vibrations of up to 5G and shocks of 50G with a wide operating temperature range of -20°C to 70°C. The VIA ART-5450 supports a flexible power source input of DC 7-36 volts with an optional power management module that supports DC 10-30 power volts and power on/power off delay, and software-based power down scheduling. Supporting two Mini-PCIe slots, the VIA EMIO-3450 can brings support for a range of 3G modules including HSPA, WCDMA, EDGE and GPRS. A SIM card slot is also included. A 20 channel GPS receiver and a 802.11 b/g Wi-Fi module are also included, as well as support for up to three antennas. Featuring a 64-bit 1.0GHz VIA Nano E processor and the VIA VX800 media system processor, the VIA ART-5450 brings performance and energy efficiency together with a full range of features including hardware accelerated HD media playback and multi display support. The VIA ART-5450 supports dual LVDS and VGA display ports, four configurable COM ports and dual Gigabit networking.